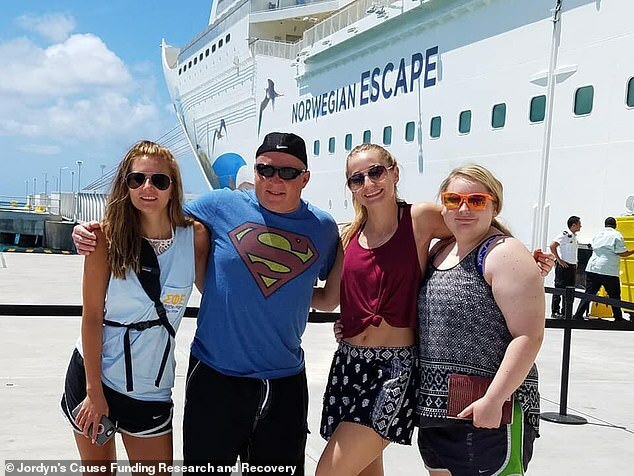 A Missouri teen has been left permanently blinded by a mysterious illness that sickened her following a family cruise last year. After the cruise in July 2017, Jordyn Walker, 15, of Smithville, began experiencing bloody diarrhea and severe stomach pains. Doctors diagnosed her with a sinus infection, but then she lost her senses: first taste and then smell. Her symptoms gradually disappeared, but then reemerged – this time causing her face to bruise and bleeding from her eyes. Despite emergency surgeries to reduce the swelling, doctors told her family her optic nerves were damaged and that she was completely blind – but that they had no idea what had caused it. ‘We went to every specialty – allergy, immunology, rheumatology – every specialty, with no answers,’ Jordyn’s mother, Kendyll, told KMBC. 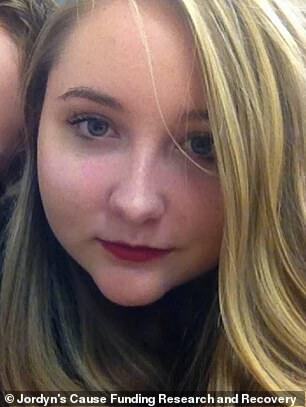 In early December, Jordyn’s symptoms reemerged. For 10 days, she had stomach pain and bloody diarrhea again, this time with vomiting. On December 12, her parents rushed her to the emergency room at the University of Kansas Medical Center. 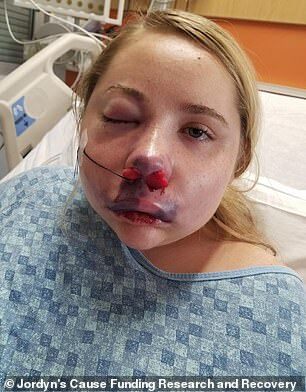 It was while the family was waiting in the ER that Jordyn’s face began to swell up and she started bleeding from her eyes. 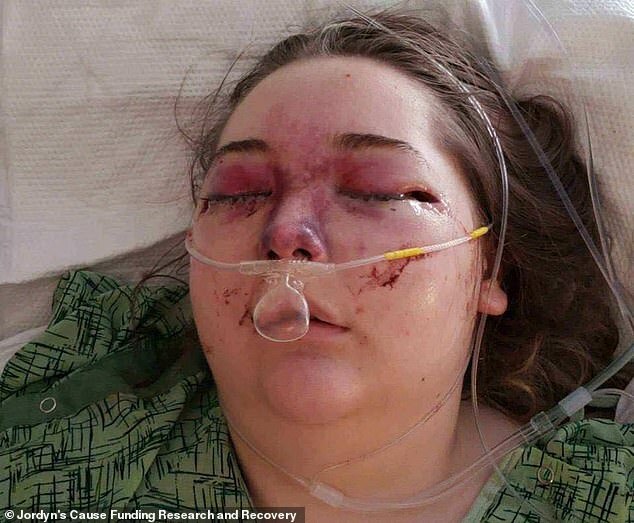 ‘My whole face just turned purple and bruised and giant with blood,’ Jordyn told WDAF. Jordyn was rushed into emergency surgery, during which bones were removed from her eye sockets in an attempt to reduce the swelling, and spent four days in pediatric intensive care. However, on December 16, doctors told her family she would be permanently blind. 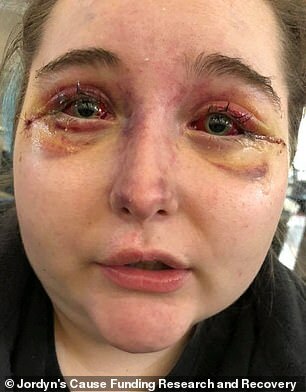 Surgeons believe the extreme blood flow to her eyes damaged the optic nerves beyond repair, according to a GoFundMe page. 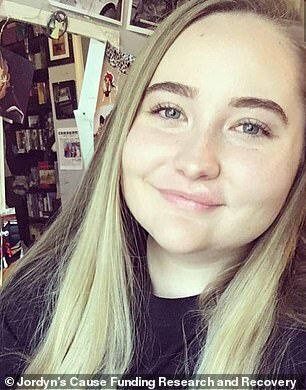 A multitude of tests have been run, but doctors have been unable to pinpoint the cause of Jordyn’s mysterious illness. ‘There’s no answers. Nothing you can do,’ Kendyll told WDAF. 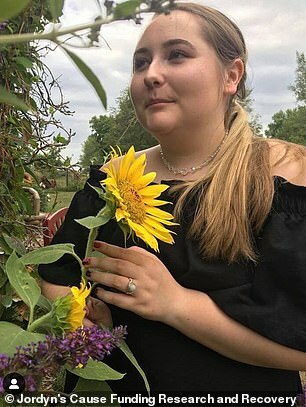 On the GoFundMe page, the family described Jordyn as a voracious reader, a skilled archer and the lead editor of her journalism program at Smithville High School. Jordyn was finally discharged on December 28. She said she feels very grateful to be alive despite losing her vision. ‘There wasn’t, like, an hour of my time when I didn’t think I was going to die,’ Jordyn told KMBC. 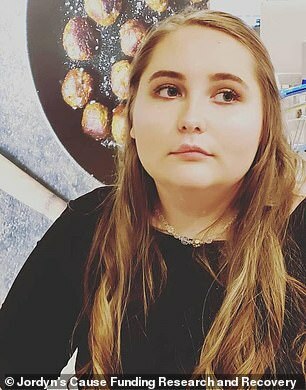 The family has created a Facebook page to provide updates on her condition and for anyone with clues to the cause of her condition to contact them. 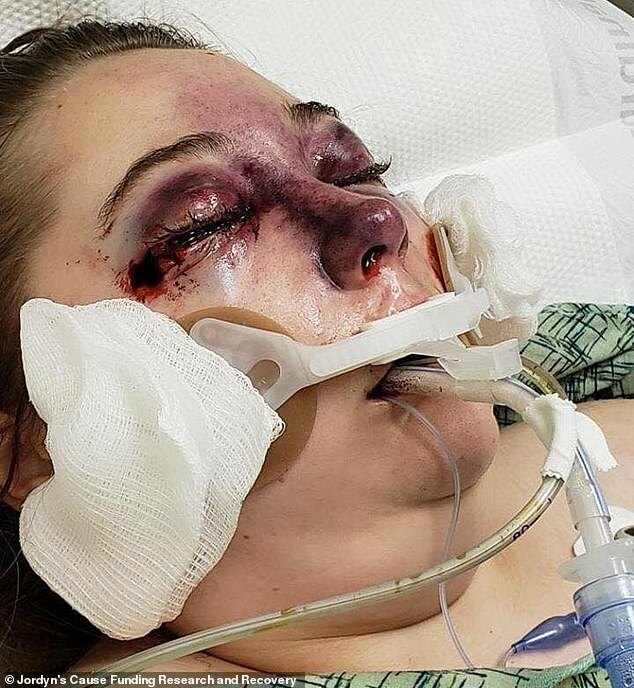 ‘If anybody has any idea what this could possibly be or what type of testing she could go through to get an answer, so this doesn’t happen again, we would be immensely grateful,’ Kendyll told WDAF. The family is currently planning a trip to the Mayo Clinic in Rochester, Minnesota, in hopes of finding answers to the medical mystery. They have also created a GoFundMe page to help cover the cost of Jordyn’s mounting medical bills. So far, more than $ 11,000 has been raised out of a $ 200,000 goal.